All reservations require a valid credit card to hold the reservation. All reservations made before Memorial Weekend require a 25% deposit. We reserve the right to request a 25% deposit any other time upon request. Large group reservations may require a larger deposit with different terms. If you cancel after 15 days and we haven’t been able to rent the unit, you will be charged for one-half of what we can’t rent. If you cancel on the day of the reservation you must pay for that day, in addition to one-half of anything we can’t rent. No Shows will be charged. If a deposit was made it is refundable, less the cancellation/processing fee of $20.00 or 10%, whichever is greater as long as it was cancelled 15 days prior to the reservation. Policies may change without notice. Sorry, we are not responsible for early departures. Early departures will be charged for the full amount of the original reservation, no credits will be given. Smoking is not allowed in the units. 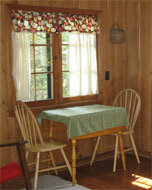 Cabins require a 2-3 night minimum stay during the weekends depending the weekend and the cabin. Motel rooms require a 2-night minimum stay on weekends. There are some exceptions in May and early June. Pets are welcome but need to remain off the beds and furniture. Please may not be left unattended. No more than two pets per unit. Extra charges may apply. These rates are per unit; if you stay in more than one unit during your stay you will be charged a pet fee for each unit you stay in.